The Suttons have welcomed children with disabilities into their home, having faith that their needs will be met. Leading with her hip, 60-year-old Debra Sutton slams her body into the van’s jammed sliding door, then jiggles the handle before again bashing the door, which has grown pockmarked by the drill. The door of the Suttons’ 14-year-old Honda is stuck. It’s a cool, clear Sunday morning and the family of two adults and five children is headed to the First Baptist Church of Sharpsville — the family split between the battered van and their 1999 Saturn sedan. Wayne Sutton, Debra’s 61-year-old husband, is pastor of the Baptist church. Debra teaches Sunday school. She gives up and uses another van door to load the kids. The Suttons have four grown daughters and six more children they have adopted or care for through foster arrangements. 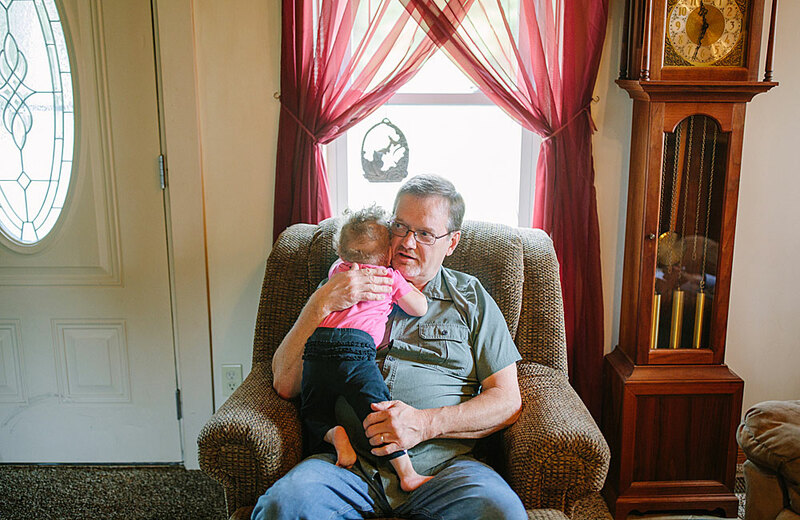 All but two of the adopted children have significant developmental disabilities, making the family’s rural Mercer County home an unlikely hot spot in the debate over what happens to Medicaid. Medicaid, government health insurance for the poor and those with disabilities, makes it possible for most of the Sutton children to live at home rather than in an institution. Four of the six adopted Sutton children were given up by mothers with drug problems, reflecting the growing national opioid epidemic. It all started with Alissa, the third of the Suttons’ four birth daughters. She didn’t cry when she was born in December 1985. The doctor said, “Uh-oh,” Mr. Sutton remembered. Several hours later, Alissa stopped breathing before being rushed to a second hospital, which had an intensive care unit for newborns. Doctors revived the infant, but she was “very delayed” in her development, Ms. Sutton said. Alissa was diagnosed with a chromosomal disorder, which causes developmental disabilities. By age 7, she stopped walking. “God gave us Alissa,” Ms. Sutton said. In 2007, the Suttons moved into a rambling farmhouse in Sharpsville they’d remodeled. It has seven bedrooms and creaking floor boards made of pine. Around that same time, Alissa was admitted to the Children’s Institute in Squirrel Hill for care. The Suttons would go on to adopt children from other agencies, but the Children’s Institute was the start: there, they were introduced to the idea of becoming foster parents to kids with disabilities. For Ms. Sutton, a native of Kansas who majored in elementary education in college, the institute experience rekindled a memory of a film she saw as a fifth-grader that featured a child who was adopted from a foreign country. The memory stuck. “I guess I have to say that’s just what the Lord gave me a heart for,” Ms. Sutton said. The Suttons have not followed the debate in Washington over Medicaid funding and don’t know the dollar-and-cents value that the government program provides for their family. “I just don’t have the slightest idea,” Mr. Sutton said. Medicaid makes it possible for the Suttons to care for their adopted children at home — covering everything from prescription drugs to home nursing visits to the nutritional drink for their adopted son’s tube feedings. 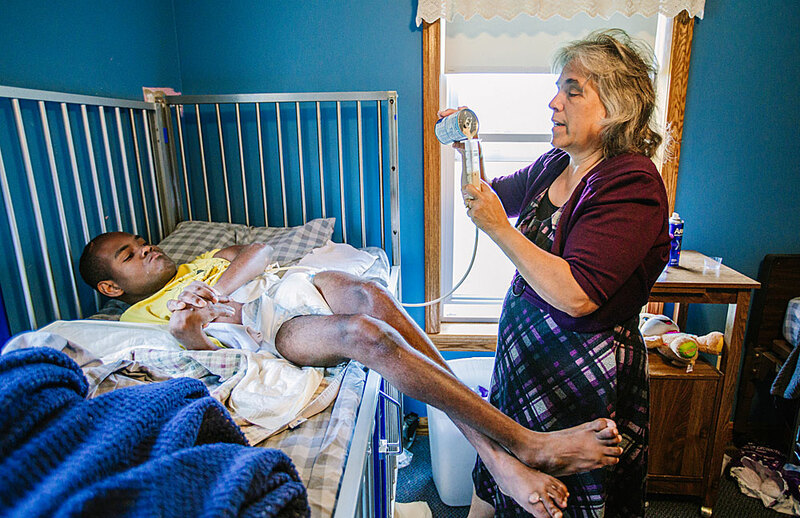 Home and community-based care cost one-fifth as much the average state institution, according to a 2009 study by the National Council on Disability. Cutting Medicaid spending and services has been front and center in Washington, D.C. Along with 61 percent of Mercer County, the Suttons voted Republican in the presidential election last year, a time when the town of neatly trimmed lawns and chain restaurants was papered over with Trump signs, Mr. Sutton said. The Senate’s Better Care Reconciliation Act, backed by President Donald Trump, would’ve cut $772 billion from Medicaid between 2017 and 2026, and reduced overall Medicaid spending by 35 percent by 2036, according to the Congressional Budget Office. It’s not clear how that might impact the $3.1 billion that Pennsylvania spends on children who are covered by Medicaid. The act narrowly failed a Senate vote in July, but the push to cut government entitlement spending isn’t over, said Tricia Brooks, senior fellow at the Georgetown University Center for Children and Families, who said the anticipated Medicaid cuts could be especially challenging for families of children with disabilities. “Pennsylvania has a Medicaid program that really goes beyond most states in recognizing the huge burden that families face in accessing care for children with disabilities,” Ms. Brooks said. Some 11.2 million children nationwide, including 469,906 in Pennsylvania, have special health care needs such as Down syndrome, cerebral palsy and autism, according to a report by the Henry J. Kaiser Family Foundation. Alissa Sutton, the couple’s birth daughter, and two of the couple’s adopted children are adults -— part of a group of individuals with disabilities in Pennsylvania who received an average $17,239 each in Medicaid benefits in fiscal 2014 or 2.3 percent more than the national average of $16,859. Debra Sutton explains the family's daily routine and why she does what she does. About 30 mostly middle-age people, including a graying Harley rider with a goatee and ponytail, arrive at the tidy brick Baptist church in Sharpsville, a borough with a declining population of 4,200. The Sutton children, three in wheelchairs, are in the back of the sanctuary. At the front, a picture flashes on a screen: a smiling Mr. and Ms. Sutton are hugging Leonid, a Ukrainian youth they plan to adopt. The new name for Leonid, who has spent the last several Christmases with the Suttons at their home, will be Daniel Wayne Sutton. He chose to change his name to better fit in and picked it himself, Mr. Sutton said. The adoption is costly — about $30,000, Mr. Sutton said. It has mostly been covered by contributions. Everyone stands and begins singing, “Bless the Lord O My Soul” as Mr. Sutton plays along on an electric Yamaha piano near the altar. Ms. Sutton, standing at the back of the chapel, strokes the flaccid hand of 27-year-old adopted son Robert, who sits in a wheelchair. Nationally, some 50,000 kids are adopted from the foster care system annually and the majority have special needs, according to Chuck Johnson, president of the National Council for Adoption, a nonprofit advocacy group based in Washington, who calls the foster family role the “toughest job on Earth.” The number of kids being removed from their homes because of abuse and neglect has risen in the past two years, probably due to the opioid epidemic. The number of children waiting to be adopted because parental rights have been terminated has ticked up 6.3 percent to 62,378 in 2015 from 58,638 in 2013, according to the U.S. Department of Health and Human Services, while 111,820 children were waiting to be adopted in 2015. God is not mentioned in the Book of Esther, which features a young Jewish orphan who becomes a queen, Mr. Sutton said, opening his sermon. Prayer is not mentioned either. Instead, God is the “unseen director behind events” in the Book of Esther, Mr. Sutton said. After the service, Mr. Sutton lingers in a hallway as people drift out of the chapel. A short, bald man stops to talk with Mr. Sutton about groundhogs menacing his cabbage crop. Mr. Sutton smiles broadly, looking relaxed. In the parking lot, Ms. Sutton is back to bashing the sliding door of the van, trying to open the frozen latch. Mr. Sutton climbs across the back seat from the other side and shakes the handle. Finally, the door surrenders, gliding open. In three days, Ms. Sutton would leave for a month-long visit to Ukraine in preparation for bringing 17-year-old Daniel Wayne Sutton home to Sharpsville for good. The kids are loaded in the two Sutton vehicles and ready to leave church, shoulder harnesses clicked, wheelchairs folded and stowed. In her tiny voice, Alissa votes for Burger King. Someone else pipes up for Kentucky Fried Chicken. A nice lunch for everyone and sometimes an afternoon nap for mom and dad is a Sunday ritual for the Suttons. “Just keep praying for us,” Mr. Sutton had told his congregation.